One of the most difficult things about being bullied is the feeling that nobody else knows what it’s like. Twenty-two of Australia’s most talented and successful people know exactly what it’s like. In candid and entertaining interviews, leading lights from across Australian life recount how they were bullied and shunned at school just for being different. Not only did they survive the ordeal but their experiences helped shape them into the remarkable individuals they are today. Bully for Them is a book filled with heartfelt words from a wide variety of famous Australians. Each of them recounts their experiences at school, many of them experiencing the brunt of bullying. Personally, I have no time or tolerance for bullies. This is a direct result of my own experiences. Even to this day, when I encounter people whose manner or actions remind me of certain people from my school days, I can’t help but judge them – the wall goes up. I know it’s not fair, but my gut instincts are more often right than wrong. They need to prove themselves to me, to earn my respect and trust. The experiences that are discussed by the contributors in the book are often very frank, and sometimes quite confronting. I mention this as I wouldn’t recommend this as a read for kids. It’s better suited to adults to see how school time experiences can shape an individual. This knowledge may help parents to spot troubled times for their kids along the way, so they can offer some help, and be there for them. As a parent, one of the things that I fear most is that my kids would become victims of bullying. I dare say that I’ve brought them up to respect others and I’m extremely confident that they would never participate in bullying others. Regular readers of this blog will know of my 9 year old daughter’s recent battle with cancer. One of the most worrying things for me when she returned to school a couple of months ago was whether her lack of hair and wearing a bandana would attract bullying or teasing. Interestingly enough, the only confronting comments we’ve encountered (overheard) have been from a small number of teens and adults in public places. It’s extremely hard to ignore, and resist the temptation to set them straight – we don’t want to draw more attention. Thankfully, she has been welcomed back to school with open arms by her friends and teachers, and she has approached it bravely and gracefully, like the true champion she is. We’re so proud of her, and I’m proud of her friends for looking after her as well. The common thread within the book is that the contributors have all taken strength from their past and turned it into something positive. They’ve grown and blossomed in their chosen field and are even thankful for the tough times, and acknowledged that they were the very things that built their character and made them what they are today. I know that most readers of this blog are not from Australia, you’re mainly USA, Canada and UK, so you may not have heard of the famous Aussies in this book. The main thing is their stories. It shows that if you are determined enough, you can overcome the bullies and shine in the world. Two standouts in the book for me were Kate Miller-Heidke (musician) and Tiffiny Hall (TV, author), both famous Australians that I’ve respected and admired for a number of years. As I read their stories I tweeted about it and was uber-thrilled to get the following replies. Tiffiny Hall is a beautiful and passionate person. My kids both think she’s awesome, they’re both definitely fans of the white ninja. 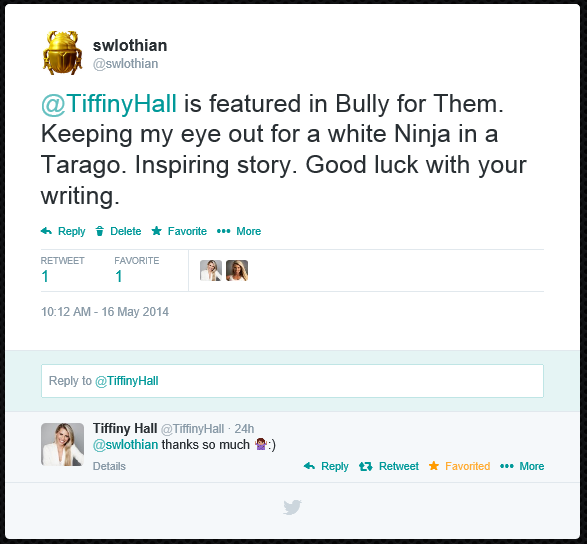 She is also an accomplished author and is actively involved in anti-bully initiatives. Kate Miller-Heidke is one of those rare, quirky and immensely talented musicians that come into play from time to time. I’ve been a fan for the long run. One of her songs, Caught in the Crowd, is one of my all time favourites. It’s about bullying. I thought it was the perfect bonus to add to the end of this review. 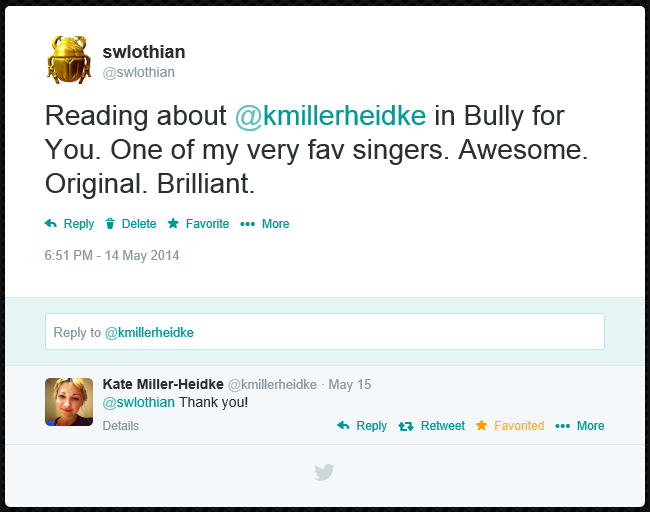 It’s also interesting to know that if you search Kate Miller-Heidke on YouTube you’ll get a load of videos of this song done by school kids as part of an anti-bullying initiative. It’s worth watching a few. This started out as a simple book review, but I think it uncovered how much this book impacted me. I’m so glad to have seen it mentioned on The Project (an Aussie TV show), at which time I immediately went online and bought it. I think this is a wonderful book.